Currently more than 700 police officers from all over Rwanda participate in the so called Selection Assistance Test, commonly known as SAT. 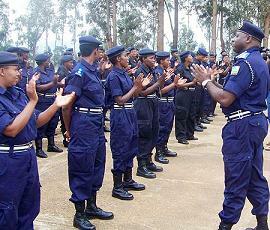 The test is a pre-requisite for all police officers before they are deployed in UN peace keeping missions. To successfully pass SAT police officers undergo six tests including reading, listening, report writing, interview, driving and shooting. Police officers are considered eligible for a UN mission if they pass all the tests with at least an average mark. As for practical tests such as shooting and driving excellent knowledge is required. He noted that their primary responsibility was to help RNP select the best police officers to serve in United Nations Peace Keeping Missions. He was overall impressed with the level of performance. Those who have passed will be put on a waiting list of UN mission opportunities. Currently Rwanda has more than 400 police officers serving in peace keeping missions in Africa and the Caribbean including Sudan, South Sudan, Haiti, Liberia and Ivory Coast.